Let's be real, Squarespace has a huge selection of awesome free fonts available for you to use on you website, and we love them for that. But do they have that gorgeous font you downloaded from CreativeMarket and used throughout all your branding and social media graphics? Chances are, nope! Don't use your brand font on your website, go with something similar, how important is branding consistency anyway? Create images of words in your font every time you want to use it anywhere, it shouldn't be too annoying to update later on, right? Upload your font directly to your Squarespace site and set it to be your H1, H2, H3 or paragraph text and use it easily and whenever you like. I think we all realize there's a pretty clear winner here, so, let's get to it! This tutorial involves a little bit of coding. Don't freak! It's basically just a copy and paste method, and it's super easy. Not as scary as it sounds, promise. Your font should either come in a .TTF or .OTF format. If it has, that's great! That's almost all that you need. Are you still with me? I swear this step is almost over. Lucky for us our friends over at FontSquirrel have made this almost impossible to screw up. Click here to the Webfont Generator and upload either your .TTF or .OTF and it will create a .WOFF and a WOFF2 for you! Easy as that. You'll see a button that says Add Images or Fonts. You guessed it, upload your three font files! Now we just need to add a bit of code in the Custom CSS box to be able to use them. Change font-name to the name of your font. For example I would change mine to Rokkitt. To change the fontURL's you'll need to click on Manage Custom Files again, and then click on one of your font files. As soon as you click on the file you will see a URL automatically pasted within the Custom CSS box. Paste this complete URL into the corresponding area in the code, between the brackets. Hit Save in the top left hand corner, because you've just successfully added your new font! So you have your new font loaded into your site, but how do you actually use it? Add it as an H1, H2, H3 or a P (paragraph/body font). Just change font-name to the name of your font. You can also change the h1 to h2, h3 or P. It's seriously that simple! If you don't want to add it as a main heading font, but you still want to use it throughout your site, the easiest thing to do is replace the H1 tag with an H4 tag. Squarespace doesn't automatically have an H4 option, so this means you are actually creating a whole new header option. If you want to use a H4 tag, you will have to use it within a Code Block (not just a reguar Text Block) but don't worry, it's super easy. Woohoo! You did it! 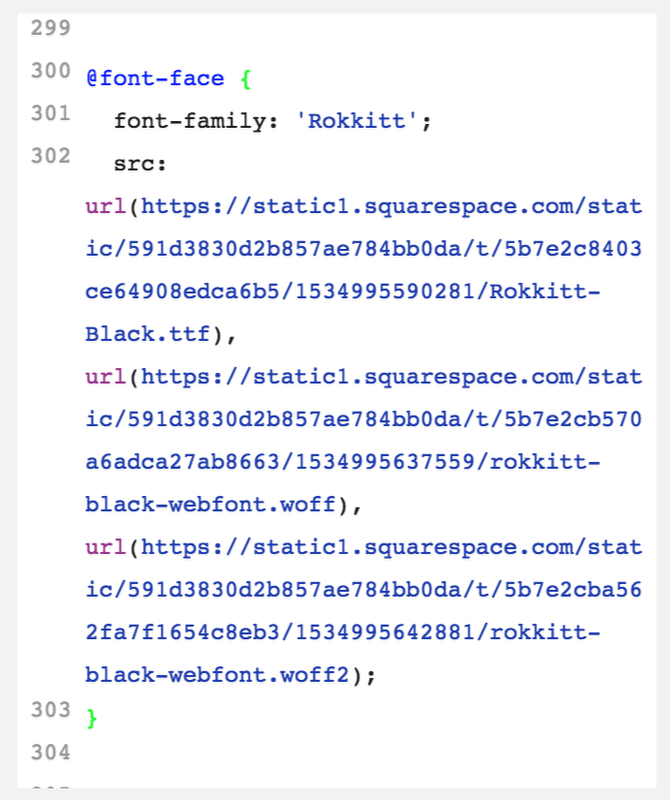 You've officially added your own custom font to you Squarespace site, no need for Typekit or fancy extras, just a little bit of easy coding. Now off you go, type away!